It was December, and I was between Messiah rehearsals. My baroque cello and I had just returned from a very different climate, and the cello was buzzing up a storm. I thought I'd bring it in to Curtis Bryant, my local repair person, just to make sure a seam hadn't opened up on our cross-country trek. Bryant who had found and restored my cello, (see "A Jewel in the Rough", STRINGS July/August 1998) had another instrument he wanted me to see. While he examined my cello (it was the wound gut strings that were buzzing--the cello was just fine), I tried out the NEW instrument. It was love at first hearing--the cello spoke to me. I wasn't in the market for a baroque cello, but, I took that cello from Curt's shop that evening--and never brought it back! Judging from the comments I and the cello have since received, I made the right choice. My new-to-me baroque cello was made in London in 1784 by a most unusual man named John Joseph Merlin (1735-1803). Just a week before I first encountered the instrument, I had read a human interest story that stuck in my mind: the creator of roller skates showed off his new invention at a party by roller skating while playing the violin. Unfortunately, he wasn't paying enough attention to where he was skating, and crashed into a large mirror, ending both his roller skating and violin-playing careers. The hapless inventor was none other than Merlin! Most of the book's information on Merlin came from a 1985 London exhibition and accompanying catalog entitled "John Joseph Merlin; The "Ingenious Mechanick". I thought I'd like to look at the exhibition book; I had no idea what an adventure this would take me on. First, my husband thought he'd "surf the net" in search of Merlin. He got hundreds of "hits", including magicians and bicycle makers, but nothing about an instrument-making Merlin. Then, after narrowing the field, we found a passing mention to his contribution to roller-skates. (Actually, Merlin probably "improved" skates, which first appeared in Holland c. 1700. It took another century before the ability to stop was worked into the roller skate design.) Finally, we hit paydirt: a site devoted to an 18th century "perpetual motion" clock made by James Cox and John Joseph Merlin, footnoted "the Ingenious Mechanick". Now all I had to do was find the book! Still at the computer, we checked a number of libraries here in the Boston area, as well as the Library of Congress--but to no avail. No one had a copy of a 15 year old British exhibition catalog. The next day, I enlisted the help of a librarian at the Boston Public Library, who was quickly able to access the information on her computer. Her response was: "Oh, there are very few copies of that in this country! The closest one is at Historic Deerfield in western Massachusetts." Back to my computer--Historic Deerfield, a preserved 18th/19th century New England town not only has an informative web-site, it had an e-mail address for its library. Within hours, I found that not only was "The Ingenious Mechanick" in their possession, but that it would soon be headed my way as a month-long "interlibrary loan". I was excited about this prospect, but was headed out of town again. Imagine my surprise when I reached California, to find that Kevin Fryer, the provider of Philharmonia Baroque's harpsichord that week had a copy of the very same catalog. It turns out that Fryer has an extensive library of works pertaining to harpsichord makers--and Merlin contributed inventions to keyboards as well. So, I was able to peruse "The Ingenious Mechanick" right then and there, while awaiting the copy on loan from Historic Deerfield. Not only that, Fryer put me in touch with rare bookseller Michael Hackenberg, who found me a copy of my very own! Thanks to the exhibition and book, we know far more about Merlin than many instrument makers, but there are still tantalizing details missing. John Joseph Merlin was born in 1735 in Belgium, but settled in London in 1760. Probably trained as a clockmaker, he worked for a time for the aforementioned Cox, before becoming self-employed in the early 1770s. He applied for his first patent in 1773, for a Dutch oven, which had a mechanical jack to turn meat. His second patent, just a year later, shows how far-reaching his interests were: pianoforte action to add to harpsichords to keep up with changing fashions. Merlin is also credited with creating the predecessor of the modern wheelchair. In the 1780s he opened "Merlin's Mechanical Museum", which he maintained until his death in 1803. Here, he could display some of his inventions and designs: automata, clocks, various gadgets and furniture. He made "transforming furniture", such as what Merlin's Museum catalogues described as "The Quartetto Music-Cabinet. It contains Flutes, Violins and Musicbooks; and by touching a spring-key, it will rise to a proper height, and form Music-desks for four performers." One wonders whether there is anything Merlin didn't try to improve. Merlin socialized with notable Londoners of the day, and was the subject of a Gainsborough portrait in 1781; in it the inventor is shown delicately clasping a recent innovation of scales for gold. 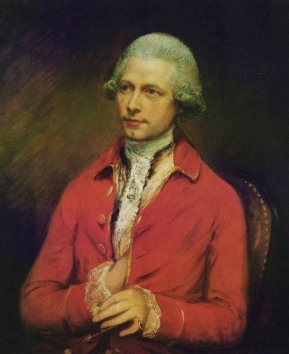 Among his frequent dinner companions were the illustrious musicologist Dr. Charles Burney, (who owned two Merlin keyboards) and his novel-writing daughter Fanny. In her diaries, particularly in the early 1780s, Fanny Burney often mentioned Merlin, usually with affection. While he moved in illustrious circles, Merlin was seen as a slightly eccentric inventor/salesman, and was always the foreigner. Here are Fanny's comments on the man: "He is a great favourite in our house...He is very diverting also in conversation. There is a singular simplicity in his manners. He speaks his opinion upon all subjects and about all persons with the most undisguised freedom. He does not, though a foreigner, want words; but he arranges and pronounces them very comically. He is humbly grateful for all civilities that are shown him; but is warmly and honestly resentful for the least slight." His keyboards were very popular: J.C.Bach is known to have performed on Merlin instruments, and the Gainsborough portrait of J.C.Fischer shows the well-known oboist with a Merlin harpsichord. Merlin was always looking to improve things, and string instruments were no exception. He offered "new-invented Pegs and Tail-pieces which prevent the strings from slipping." Unfortunately, neither the tail-pieces nor the pegs have survived--perhaps they didn't work as well as advertised? There were originally much larger peg-holes in the head of my cello, which have been filled in. In early museum catalogues, Merlin boasted that he could improve the tone of "old Violins and Bass Viols...to great Perfection". This had to do with the changing fashions: the "old" instruments were Stainer models, while the ones coming into vogue were the Cremonese instruments--Stradavarius, Amati and Guarnari. I am struck by the fact that my "modern" cello, made in London in 1774 by William Forster, is based on the Stainer design, but my Merlin cello, built a mere 10 years later, is clearly based on a Stradivarius model. Merlin made two very unusual cello-like instruments, which were on view at the exhibition. One was a curious guitar-shaped "tenor", now in disrepair. The other was a "pentachord"--a small, five-string cello tuned C-G-D-A-d. Commissioned by Sir Edward Walpole, it was the instrument for which famed cellist Cervetto composed his Opus 3 sonatas (1777) for cello and bass. The pentachord, which has a smaller body than a regular cello, has since been modified to a four-string child's instrument. Interestingly, although it is clearly stamped "Merlin", the pentachord was made by a Mr. Carter, who also worked for the esteemed instrument maker William Forster. It has been thought that with the variety of things that Merlin did, he could not have possibly made all of the string instruments that came out of his shop. Indeed, some instruments bear Merlin labels with the words "improved by" as opposed to "made by". While my cello has no label, it is stamped with Merlin's name on both the scroll and the button. Also, thanks to sophisticated fiber-optics, Bryant discovered that it is signed, in large letters, on the inside of the top of the cello, below an f-hole, with the words "Made by Joseph Merlin, 1784, Princes Street, London". Perhaps in this case, Merlin really did have a hand in its construction? I am normally not one to make snap decisions, but this just seemed like the right instrument for me. I knew that if I didn't purchase it, I'd always be sorry. Not only is my Merlin easy to play, incredibly responsive, and easily fills a room with sound, it's the first non-endpin cello that doesn't give me backaches. It's just my size! I knew that Merlin stamped numbers on his violins, and was quite amused to notice recently that the number stamped unobtrusively on the scroll of my cello is 54, which is my house number! I've framed a copy of the Gainsborough portrait, so Merlin keeps me company while I practice. Merlin's picture is from a book by John Joseph Merlin: The Ingenious Mechanick, The Greater London Council, The Iveagh Bequest, Kenwood, Hampstead Lane, London NW37JR, © 1985. The painting is by Thomas Gainsborough. All rights reserved ISBN 716815826. Designed and produced by the GLC Public Relations Branch and printed by Gavin Martin Ltd. The Greater London Council, County Hall, London SE17PB (first publisher).